There is a perception among several African countries and commentators that the International Criminal Court (ICC) has been initiating criminal investigations in a lopsided manner— to the detriment of African countries. Dundee Africa Research Network (DARN) first set this question for discussion on 3 June 2006 when Dr Patrick Tom was invited to drive the debate. There have been several interesting developments since Dr Tom’s presentation. Some African countries have merely alleged selective justice by the ICC. However, on 27 October 2017, Burundi made history as the first country to withdraw from the Rome Statute of the International Criminal Court. This withdrawal inevitably reopened the debate on possible political manoeuvrings in Africa-ICC relations. Kurt Mills (Professor of International Relations and Human Rights) was a special guest speaker on 15 November 2017. Professor Mills thoroughly examined how some African countries have resisted the ICC. There was a concession that the ICC system was not perfect. Professor Mills, however, also observed that the withdrawal of Burundi was unlikely to trigger a domino effect on other African countries. The question and answer session was very engaging and it showed that Africa-ICC relations will remain controversial for the foreseeable future. This is especially so as some African counties (or their citizens) continue to support the ICC. Participants at the event reflected the interdisciplinary focus of DARN. Undergraduate students, postgraduate students and researchers participated. We thank everyone for attending. We are also grateful to Professor Mills for the detailed presentation. We are pleased to invite staff and students to a DARN Talk which will focus on Understanding the Dynamics of the Africa-International Criminal Court Relationship. The guest speaker is Kurt Mills— Professor of International Relations and Human Rights at the University of Dundee. Although African countries were some of the strongest supporters of the creation of the International Criminal Court, the relationship between Africa and the ICC has become increasingly fractious, resulting in the withdrawal from the Court of one African country, and threats from others to withdraw. What are the dynamics of this relationship? This talk will examine the strategic and tactical forms of resistance used by African states against the ICC. Kurt Mills is Professor of International Relations and Human Rights at the University of Dundee. He has previously taught at the University of Glasgow, Gettysburg College, James Madison University, Mount Holyoke College, and the American University in Cairo, and served as the Assistant Director of the Five College Program in Peace and World Security Studies at Hampshire College. He has held visiting positions at Addis Ababa University, the School of Advanced Studies University of London, and the University of Queensland. His research focuses on the development of international norms and institutions related to human rights, humanitarianism, international criminal justice, and the responsibility to protect, particularly in the context of sub-Saharan Africa. Kindly accept the best regards of DARN's facilitating team. On Thursday 28th September 2017, DARN held its first event of the new academic year. Dr Daisy Nwaozuzu delivered an interactive and informative talk entitled "Research Ethics: Differing Perspectives from Africa and the UK". The main aims of this talk included the definition of research ethics, the history, legalities and key issues surrounding research ethics, different ethics perspectives from the Northern and South-eastern regions of Africa, the challenges and dilemmas of researching within Africa, benefits of researching on Africa whilst outside of Africa, as well as lessons learned from research ethical practices within the UK. The overarching theme of the session appeared to be the differing cultures surrounding these different regions, particularly regarding consent by children or women in North Africa, informed consent, vulnerability of the populace, privacy, coercion and inducement. In addition, self-reflective questions were posed. Such questions concerned data protection, rights of withdrawal from the research process, ethical dilemmas arising from sponsorship, as well as the rights of vulnerable people involved in certain aspects of research such as surveys. We would like to extend our gratitude to Dr Nwaozuzu for the informative and interactive delivery of a vital area in research, especially in the wake of increasing research efforts being undertaken with a special focus on African countries. We are pleased to invite staff and students to the first DARN Talk for the new semester. The talk will focus on Research Ethics: Perspectives from Africa & the UK. The Guest Speaker is Dr. Daisy Nwaozuzu from the School of Education and Social Work at the University of Dundee. This discourse explores the differing conceptualisations of research ethics across the African continent and the dilemma surrounding the conduct of research in cross cultural contexts in comparison to the United Kingdom. With an increased number of African students in the UK who are carrying out various research on national, regional and global issues, this presentation seeks to explore the incongruities of culture, consent, and understanding of family, gender and children as participants. It aims to address the challenges as well as benefits of conducting such international cross cultural research as compared to the ethical practice in UK- based field studies. Dr. Daisy Nwaozuzu is an Associate Tutor at the School of Education and Social Work at the University of Dundee where she recently completed a PhD programme with the thesis titled - The effectiveness of information and communication technology on generic skills development: Teachers, pupils and employers perceptions. Her research was inspired by her eight years’ work experience in the IT sector of a bank in the UK and past work experience as a Learning Technologist within schools, further education and higher education. As a qualified teacher with specialisation in teacher education, Daisy supports and contributes to teaching and learning across educational suites within the School of Education and Social Work and the Medical Education Department of the School of Medicine at the University of Dundee, Scotland. Daisy also holds a master’s degree in IT and management from St Andrews University, Scotland and an MBA and a bachelor’s degree in educational management / political science from Lagos State University, Nigeria. Venue: Room 2G14, Dalhousie Building, University of Dundee. It is with great delight that we welcome you to a new promising academic session. With keen observations, it is apparent that notable transformations have been taking place in our prestigious University during the holiday. As we return to the campus, we can see a scintillating appearance of the University's main library. We can see the modern technology-driven learning facilities newly introduced to ease the rigorous processes of learning while remaining committed to keeping the University's ranking higher in Scotland, the UK and the World. Our University is now more interconnected in an interdisciplinary sense of collaborations across departments and schools, as it resolves to continue transforming lives globally through cutting-edge epistemic pool of ground-breaking research that addresses human condition around the world. We are entering a new chapter as a centre of excellence in teaching and research, and Dundee Africa Research Network is keying into this aspiration. “Africa and the Scottish Diaspora”. Also, DARN has successfully written its Charter. Thanks to the combined ebullience of our talented co-conveners. A special appreciation goes to Pontian Okoli, Geoffrey Mabea, Rhiannon Dempsey, Daniel Edwin Gilbert, Eddie Holmes and my humble self for preserving the spirit. 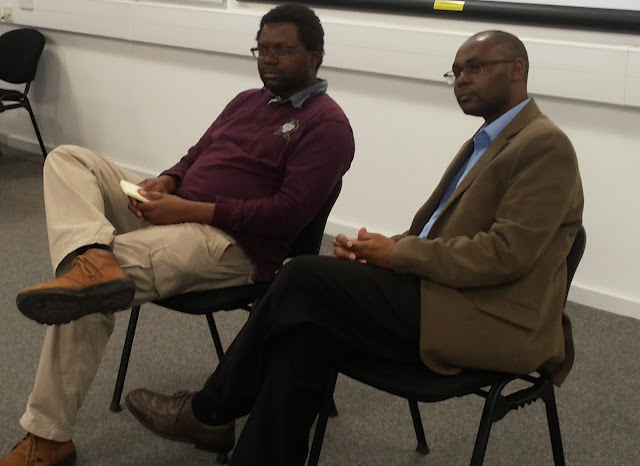 Of course, Dr. Edwin Ezeokafor is also appreciated for co-founding DARN, and Dr. Martin Elvins, now the Head of Department of Politics in the School of Social Sciences, for seeing the future in DARN when we first embarked on this very time demanding journey of showcasing the best of the Africa and the Africanist scholarship in Dundee. We appreciate the support of Mr. Ajit Trivedi, the Head of Equality and Diversity of the University, as well as Mrs. Claire Milnes of the School of Humanities for the early support. Our list of appreciation is an endless one. We appreciate you all. Yes, here we are today with the gratitude. We planted our own intellectual seed towards the tail end of the golden jubilee of this great University. Now, we face the next fifty years ahead. We mean business and we shall continue to commit ourselves to uplifting the reputation of this great citadel of learning and making it a homely intellectual base for African students, and researchers on African subjects irrespective of their race. At this remarkable juncture and with our continued altruistic spirit, on behalf of my colleagues in the Co-convenorship, I hereby introduce our new team members who have filled the key positions as stipulated in the DARN Charter. JULIET AGBEIBOR is now a DARN Co-Convenor. REBECCA MUTESI is our first Communications Director. PEARL ORUAMABO is our first General Secretary. Thank you all, and accept the best wishes of our great team as we journey into a new session of service to our University and its environs. After many months of deliberations and drafting, Dundee Africa Research Network presented its Charter in April 2017. The Charter is a 26-page detailed blueprint and regulatory guide for DARN. The unveiling and signing ceremonies took place on 19 and 27 April respectively. The DARN Charter contains provisions concerning critical aspects of DARN including its initiative background, governance, scope and strategic plan. The Charter builds on the successes and experiences of DARN since its inception in June 2015. The aims, vision and operational strategies of DARN are thus clearly articulated. The Charter provides a solid foundation for building strategic partnerships internationally and ensuring that the long-term goals of DARN are realised. DARN is grateful to its members, University staff, friends, members of the Scottish Parliament and the host city for all their invaluable support. There were news reports of the signing ceremony within and outside the University of Dundee. 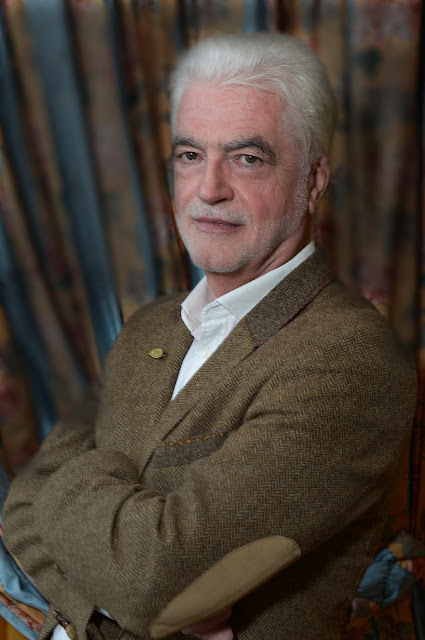 Billy Kay is the author of The Scottish World, and the producer and presenter of several series of radio documentaries about the global effects of the Scottish diaspora. Here Billy will place Dundee’s Calabar Missionary Mary Slessor in the context of this diaspora and look at the profound effects of the Scottish missionary effort in Malawi. He will also comment on other places where presbyterianism was planted from South Africa to Russia to Brazil. The talk will be illustrated with audio from Billy’s BBC Radio Scotland programmes and will include music from Mary Slessor’s Duketown Parish Church in Calabar, and the voices of the daughters of Daniel Slessor, one of the children saved and adopted by Mary. Follow the link below to book your place. We were delighted to welcome Dr Matt Graham as our guest speaker on 13th March 2017. His presentation was titled: “African National Congress and the Politics of History in South Africa”. The participants had different backgrounds including politics, law, economics, history, and broadcasting. Rhiannon Dempsey (left) facilitating the talk and Dr Matt Graham (right) answering questions after his presentation. He examined how the continuing symbolism of the ANC as a resistance to oppression and misrule, was being exploited by key political actors with a view to maintaining a grip on power. The speaker then considered whether there was a link between the pivotal role of the ANC and the reality of current governance issues, political tension, and economic challenges. Some of the participants. Dr Matt Graham is seated fourth from the left. These set the stage for several incisive comments and questions from participants. Some contributors explored the possible link between the complicated colonial history of South Africa, the peculiar context in which the ANC was formed, and the current socio-economic challenges. There were also comments concerning the future of the ANC considering the politicisation of history and how such politicisation may influence other countries in the region. We would very much like to thank Dr Graham for his participation as well as those who attended and contributed to the event’s success. Dundee Africa Research Network (DARN) is pleased to present Dr. Matt Graham as the guest speaker on the forthcoming talk titled 'African National Congress and the Politics of History in South Africa'. The overview of the presentation is provided below. We look forward to welcoming you to this fascinating lecture. On August 3 2016, South Africa’s governing African National Congress (ANC) suffered unparalleled losses in the local government elections. What made the 2016 local elections so important was that the hegemony of the ANC, a party which played a leading role in the downfall of apartheid, and has dominated the political landscape since 1994, looked under serious pressure for the first time. This is the only election in the post-apartheid era in which the ANC has received less than 60% of the national vote. Yet, despite a maelstrom of scandals and mishaps that surrounded President Jacob Zuma and the ANC, encompassing an impressive list of issues such as Nkandla, Guptagate, and #feesmustfall, millions of South African’s still remained remarkably loyal to the party of liberation. An important reason for this loyalty is located within the disputed realm of history and the mainstream reinterpretation and utilisation of the past by the ANC. In this paper I will explore some of these contested issues by delving into some of the ‘myths’ of the past by examining the role of historic remembrance in modern South Africa, offer a sense of the continued power and influence of the liberation struggle (especially within a Southern African setting), while demonstrating how the official narrative is promoted. The paper will offer a sense of how a self-serving portrayal of history designed to suit their current political demands centred on the continued retention of power remains an important electoral tool. Bio: Dr. Matt Graham is a historian of modern, sub-Saharan Africa, with a particular focus on South Africa. Matt is interested in national liberation movements; nationalism; the 'invention' of traditions; and the development of post-colonial governance. His first book 'The crisis of South African foreign policy', which examines the historic trajectory of the ANC's foreign policy from exile to power came out in 2016. Join us in this fascinating talk. Dr Patrick Tom’s talk on the exclusion of African scholars in the Liberal and Post-liberal Peace Debate on Friday, 24 February 2017 included researchers and academics from various backgrounds. The presentation created an atmosphere for provoking thoughts concerning the scholarly contributions of the global south. Dr Tom focused his presentation on the post-cold war peace projects that were underpinned by liberal values and observed that Africans, especially Africa-based scholars, were missing in significant parts of the literature. Beyond the focus of the speaker, many scholars who were present drew from their disciplinary perspectives. The talk subsequently provided an opportunity for interdisciplinary reflections on intellectual contributions generally and explored the possible way forward. There were several insightful questions and comments such as the importance of controlling or shaping narratives. Some participants considered that the quality of ideas concerning African development was as important as accessing the international platforms for scholarly publishing and disseminating information generally. The discussions also concerned general governance issues including the challenges of corruption and fair reporting in Africa. There seemed to be a dominant view that it was necessary to strike a balance between trying to control narratives and encouraging vibrant polities including free speech or criticism. The event ended on a positive note with suggestions from some researchers and academics that Dundee Africa Research Network should consider setting up a scholarly journal or other similar publications. Such publications will improve access to platforms where issues concerning African development can be discussed at the global level and attract more attention. Members of the Convenorship Team are grateful to Dr Tom for his fascinating presentation. Many thanks also to all the participants. Date: Friday, 24th February, 2017. Venue: Room 1G05, Dalhousie Building, University of Dundee. A growing literature has evaluated the international approach to peacebuilding in societies emerging from violent conflict. There is a general agreement that, for the past two decades, this approach has been grounded in the idea of the ‘liberal peace’ – the idea that liberal democracies are by their nature more peaceful than non-liberal democracies. Scholars based in the global north have dominated research and publication on the liberal peace. Yet, much of international peacebuilding which is liberal peace-oriented has been taking place in the global south, including Africa. African peace scholars based in Africa have largely remained silent on this debate, which has an impact on knowledge production and dissemination. This presentation aims at provoking debate on the issue of excluding African voices in this debate. Patrick Tom earned a PhD in International Relations from the University of St. Andrews where he has also taught International Relations of sub-Saharan Africa. He also taught Philosophy at the University of Zimbabwe and several theological colleges in Zimbabwe. Patrick has conducted research in Africa including Uganda, Sierra Leone and Liberia. He has published in the areas of Applied Ethics, and Peace and Conflict Studies. His forthcoming book is titled Liberal Peace and Post-Conflict Peacebuilding in Africa. Kindly share this invitation with staff and students within the University and beyond. In honour of the UN Day for the Elimination of Violence Against Women, we held our last event for the year 2016 on the 25th November, on the theme, 'African Women in Literature and Film; Strength and Resilience'. The event was a combination of literary aesthetics and reflections on the challenges that women face and their significant contributions in the society. It began with a selection of readings from the members of the audience on the theme of the event. Among the selections, we had a reading of Maya Angelou’s ‘Phenomenal Woman’, prose by Ijeoma Umebinyuo, Moshood Folorunsho's 'My Kenyan Lady' and a selection of original works by 'Dele Kogbe. After the first set of readings, our keynote speaker, Dr. Nicole Devarenne of English Department, University of Dundee, gave her presentation on the role of women in African literature and film. She explored a variety of literary and cinematic works from the prominent African writers and a filmmaker, looking at the key female characters featured in each of the works. Notable works included those of Chinua Achebe, Bessie Head, Sol Plaatje, Tsitsi Dangarembga, Amos Tutuola, Chimamanda Adichie and Ousmane Sembene. The event was concluded by one further reading before the vote of thanks marking the end of the programme. Members of the convening team would like to extend thanks to all who attended and contributed to the event as they were crucial in making it a success. Our thanks also go to Dr. Nicole Deveranne for being our keynote speaker. We look forward to a more stimulating engagement in the year 2017. Have a prosperous new year!